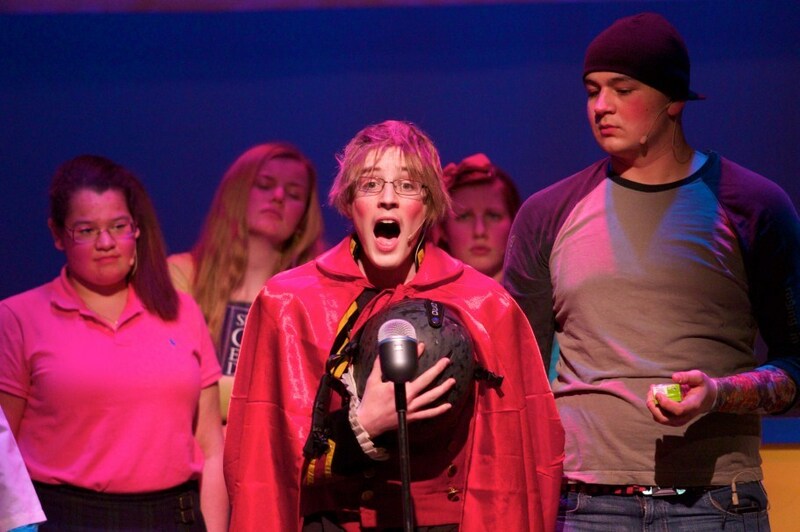 Our theatre program plays a cherished role in the lives of our students. Theatre provides them with the opportunity to interpret existing works of art in new ways, and the challenge and thrill of the collaborative process. Students learn the value of hard work, dedication to a craft through repetition and critique, and the true sense of ownership one has over their learning in the moment of performance. The curriculum is constructed to give students a strong taste of stage work as well an appreciation for the importance of the theatre in shaping the world and culture around them. All theatre and film classes value communication, storytelling and the importance of “play” in the artistic process. We offer courses for the fledgling performer, including Introduction to Acting and Improvisation and Theatre Games, as well as courses in special topics such as musical theatre and Shakespeare for more experienced actors. These performance-based classes teach the craft of acting, offering instruction in technique, voice, body, and memorization. As well, we offer an array of film courses focusing on ways the medium reveals history, identity and the human condition. New Play Lab and Storytelling through Film are two recent additions to our class selection; these electives guide students through the process of creating original work, including script development and directorial considerations. There are also opportunities to learn about and participate behind the scenes on the technical side of a production. Beyond the classroom, the Annual Play Production, which takes place in the Winter term, has become one of the highlights of the school year. For those who are a part of it—in a typical year some 25 students have a hand in the production—the production fulfills Dublin's winter sports requirement. More importantly, it bonds them like few projects can, forming a tight-knit group to take on a demanding, intense, and rewarding creative process. It culminates with five sold-out performances in our versatile 125-seat theater in the Fountain Arts Building. Here you will develop methods for presenting work in the genre of musical theater. Topics include the fundamentals of acting, text and score analysis, character development, and performance techniques. While this course is primarily performance-based, you will also gain a broad understanding of the history of musical theater, beginning with its origins in burlesque and vaudeville, through the “Golden Age” of musical drama, and ending with the more contemporary styles of today. In this class you will explore how writers, producers, and directors become involved in making historical films. What influences filmmakers’ interpretations of the past? Why do these interpretations incite controversy? How do the authors of these films respond? You will be asked to recognize the danger of excessive artistic license, while also understanding the importance of creative imagination. Your work involves writing essays on themes, social issues, and character development shown in the films studied. Topics may include the Vietnam War and other wars, organized crime, race relations, and politics. Shakespeare's plays, though often studied as great works of literature, were written to be performed. The intricacies of language, verse structure, character, and symbolic meaning are best understood by embodying his words. In this course, you will not only read works by Shakespeare but also practice and experiment with styles of acting in order to communicate to an audience the images and ideas present in his language. We begin our investigation with his Sonnets, then move on to character study through monologues and scenes from the plays. We will also treat physical and vocal aspects of the Elizabethan theater, noting how Shakespeare's texts have been "translated" to different cultures and settings while maintaining the same tension and drama present in the original work. It’s never been easier to shoot, edit, and distribute video to a wide audience. The ability to make a video, however, is different from the ability to use it to tell a story. Video images can be composed and combined in specific ways to convey a desired message, much as words can be combined into sentences, paragraphs, and stories. There is a “visual grammar” that has its own set of rules, most of which were discovered in the early days of motion pictures. They form the foundation upon which all films and videos are based today. Knowing the rules, and knowing when to use them or break them, gives you the power to tell your stories visually. This course will focus on learning the techniques and skills that will allow you to communicate your vision to your audience. The course comprises a number of short projects and a final project to end the term. You will be asked to participate in group critiques of the work of others, and to be receptive to criticism of your own. New Play Lab focuses on the process of creating a new theatrical production, and students work with a playwright-in-residence toward the development of an original play. The first term focuses on laying the groundwork for the collaborative process; you will examine ensemble theater structures, famous theater groups, and diverse ways new plays are developed. The second term is focused around the writing process and script development. The third term combines these elements and transforms the play into a performance piece. New Play Lab can be taken as a full-year course or by the trimester. I love to collaborate; I love to help others arrive at a new place, a more fulfilled place. In my own performance career, I have loved the exchange of energy, thoughts, imaginations between myself and my fellow performers, the audience, the music, and the space. This exchange is the same in teaching; dialogue emerges in the classroom. I cannot simply “teach what I know.” That is a part of it; I have worked and trained and thought long and hard about what performance is to me. I do bring a certain authority to the classroom; yet as with living, one must remain open to change, new perspectives, and the unexpected – this all comes into play when I teach a class or lead a rehearsal. When I mention to people that I have a technical theater degree, they always seem surprised. It seems like the default participation for theater is on the stage, but it never was for me. The technical aspects of the show are, for me, the completion of world that the actors, music, and words begin. The lights, costumes, make-up, props and sound are all vital to the actors and the audience. Technical elements turn people into animals, kings and jesters. They turn a black box into a forest, an island or a grand estate. It is also pretty common to be tasked to use what you have to make things work. Working through the creative process of transforming something from a dusty basement life to a vital addition in the spotlight of a play is a constant challenge that continues to inspire my work in the theater. I savor working on the technical aspects of a play and putting the finishing touches on the audience’s experience. Sharing the problem solving skills and challenging students to accomplish the creative goals of technical theater has continued to inspire me to share the joy of enhancing the show with our work.